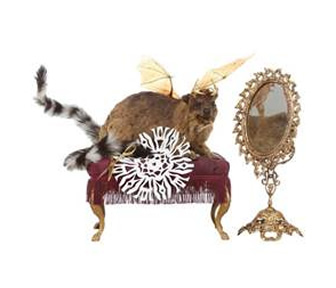 Catherine Coan, a prolific assemblage artist, taxidermist and art history professor will present a unique exhibition at the Los Angeles Art Show. Part sculpture and part assemblage, Coan incorporates trophy taxidermy to create surreal scenes reminiscent of what one might find in a darkly humorous natural history museum. Combining imaginary hybrids and true-to-life creatures in improbable contexts, Coan creates a wild Victorian Salon in the tradition of the still, dark, yet strangely life-affirming sentiment of Paris’ taxidermy palaces Musèe de la Chasse et de la Nature and Deyrolle — spaces that delight in and confront the animal within and without us. Rich with beauty and a stark violence apparent only in dreams, her works ask us to explore our humanity – the unconscious and our choices in the world. Moving through the installation, one sees the large, worn Oriental rug; the twinkling chandelier; the burnished wood and deep velvet of antique furniture. 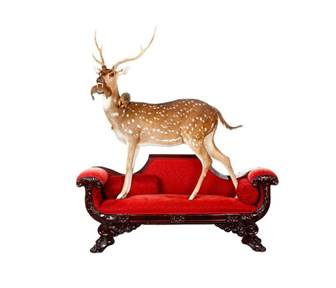 There, poised in his moment of victory on a loveseat, stands a carnivorous stag, a squirrel limp in his glossy fangs. 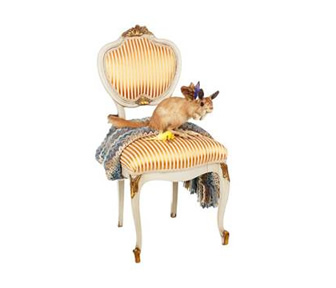 Nearby, on a footstool, is a hyrax replete with two striped tails, bat wings, and small golden antlers; he gazes sadly into a gilt mirror, recognizing his solitude in the universe. In the center of the room, just having ravaged the dining table on which he stands, bone china crushed under his hooves, is the bushpig who was meant to be dinner, the apple still in his Coan’s work embodies the uncanny, tongue-in-cheek side of Art Walk, while speaking to the fiercely independent and ever-evolving spirit of the Downtown Arts Community. In recent years, the LA Art Show has become the most internationally diverse art platform in the Western world, bringing in the largest groupings of Korean, Chinese and Japanese galleries outside of Asia. Beginning in 2010, the Show has actively developed its international gallery offerings to provide collectors with a unique opportunity, to spot international trends and zeitgeist through art, a medium that has the ability to transcend language. Catherine Coan holds an M.F.A. in creative writing from the University of Washington. Her work has shown at Lois Lambert Gallery / Gallery of Functional Art, La Luz de Jesus, Stremmel Gallery, Bedford Gallery, and other fine art galleries across the U.S.